If you block ads, webpages will load faster and look cleaner. By blocking ads, you also block the source of many tracking cookies. Under Block ads, tick the Block ads and surf the web up to three times faster checkbox. Click the Manage Exceptions button to set site-specific preferences. By default, a few sites are not blocked. When ad blocking is enabled, you will see a badge in the combined search and address bar. Click on the badge for more information, including the number of blocked ads, a speed test, and a site-specific switch for unblocking ads. While private windows do not leave any record of the websites you visit, if you deliberately save data, for example if you save an item to your Speed Dial, save a password or download a file, it will still be visible after the window is closed. By default, Opera stores certain browsing data to help speed up connections, load common page elements, and generally interact better with the sites you visit. You may wish to remove traces of your browsing habits by clearing your private data. From the main menu, select Opera > Clear Browsing Data…. Select the time period from which you’d like to remove history items using the Obliterate the following items from dropdown menu. Go to O Menu > History > Clear browsing data. Deleting cookies and other site data will remove any tracked site data. Read more about managing cookies. Emptying your browser’s cache will delete any temporarily stored data from websites. The cache is used to temporarily store page elements, such as images or search queries, so if you wish to access the site again, you can reduce loading times. Emptying this cache will clear up space on your local disk. Opera warns you about suspicious pages by checking the page you request against a database of known “phishing” and “malware” websites. To protect yourself when entering sensitive information, always look for the lock in the security badge. Badges indicate details about the page you are viewing. When a badge appears in your combined search and address bar, click it to see more information, including security certificates and more. If a website is found on the blacklist, you will be presented with a warning page, and you can decide whether to visit the website, or to go to back safely to the previous page. Fraud and malware protection does not cause any delay in the opening of pages. If you are browsing on an encrypted connection (https://), Opera checks to ensure that all parts of the site are encrypted. If Opera detects that any live elements of the page, for example scripts, plugins, or frames, are being served by an open connection (http://), it will block the insecure content. This means parts of the page may not display properly. Security certificates are used to verify that a website is secure to use. Most of the time certificates are fully valid. If you see a green padlock security badge in your combined search and address bar, you can proceed safely with your browsing. If you’d like more information about a site’s security certificate, click the security badge and select Details. Opera will summarize the certificate’s issuer, the type of certificate and whether the issuer is publicly-known and valid. 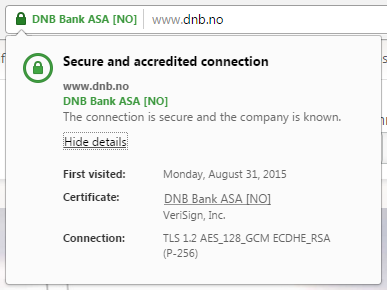 Under HTTPS/SSL, click the Manage Certificates button. If you want, you can configure Opera to warn you about public sites that use certificates from local issuers. If you continue to browse on these connections, be aware that some security measures, such as certificate pinning and Certificate Transparency, will be disabled for all such connections during your browsing session. Under Privacy, tick the Send a ‘Do Not Track’ request with your browsing traffic checkbox.